We are thrilled to share some exciting news with you! We have begun renovations in Our Lady of the Angels school to expand our outreach to the neighborhood. The building will serve as a retreat center for poor parishes, provide additional volunteer housing (up to 69 bedrooms! ), have break-out rooms and classroom space for adult programming and expand our storage space for our growing amount of donations. The use of the school building has led to many blessings for our neighborhood. At our senior citizen’s Thanksgiving potluck, Mattie, shared a story of gratitude that highlights the wonderful things God has already done through the school building. Mattie had been without a functional stove for over a year, and was cooking all of her food in her microwave. Thanks to the new storage space in the school, we were able to receive a large donation of appliances and were able to give Mattie one of the stoves. Mattie shared her excitement and gratitude that she would be able to cook the turkey she received from us this Thanksgiving! Our Tuesday food pantry, which moved to the school in August, has DOUBLED in size because of our capacity to store more food and process our pantry guests more smoothly. We have been able to accept truckloads of much needed donations from warehouses that we would have otherwise had to turn away. The school, however, needs a lot of work, such as: a new boiler, a new roof, and a plumbing overhaul. Additionally, we need to install a new industrial kitchen, construct walls in the 3rd floor residence….and the list goes on. We’ve determined that phase 1 of the school renovation (boiler, plumbing, roof) will cost about $500,000. Because of an amazing grant from the Home Depot, we’ve started this project with a substantial $25,000. We need your help to get to that $500,000! Of course, the school is only a small portion of what we’ve been up to. 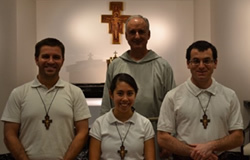 This year we welcomed three new members to our growing Franciscan community - Alan, Matt, and Theresa! They’ve been an incredible blessing. Please continue to join us in praying for vocations as we are confident that God is calling many more young men and women to join us in caring for the poor and sharing the Gospel through preaching and teaching. Stay up to date with Mission events at www.missionola.com! Know of our gratitude for your support, prayers, and generosity, without which our work would not be possible. Be assured remembrance in our daily prayers and Masses, and please let me know if you have any special intentions you would like us to pray for. 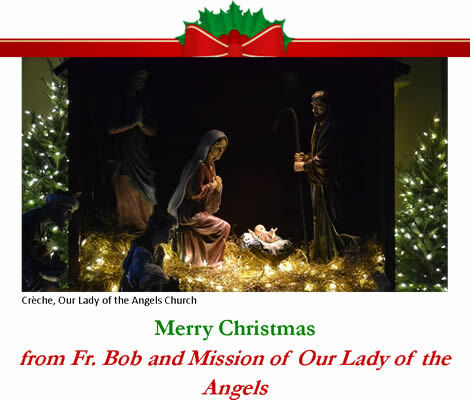 May God Bless you and your loved ones with a Merry Christmas and a Happy New Year!